As reported in a previous RailLine, CN filed its “Notice of Dispute” to the Federal Minister of Labour on Friday, November 7th for Clerical, Mechanical and Intermodal from CN Agreement 5.1, Excavator Operators from CN Agreement 5.4, and CNTL Owner-Operators, all represented by Unifor National Council 4000, and Shopcraft from CN Agreement 12 represented by Unifor Local 100. Unifor promptly submitted a “Notice of Dispute” for our running trades members employed by CN on the former Savage Alberta Railway territory. On Monday November 17th, Unifor filed its “notice of dispute” to the Federal Minister in regards to shopcraft members represented by Local 101R employed at CP Rail. These “Notice of Dispute” applications started the process outlined under the Canada Labour Code’s conciliation process which is required prior to either party being in a legal position to begin strike or lockout activities. The conciliation process is a concise and legal requirement of the Code and provides a 60 day period of conciliation followed by a 21 day “cooling off” period. Either party is obligated to provide 72 hours’ notice of intention to initiate a lock out or strike. On Tuesday November 25th, the Federal Minister appointed conciliation officers to all Unifor bargaining tables at CN, CNTL, Savage Alberta Railway and CP Rail. We anticipate the conciliation officers will be present at future bargaining sessions scheduled with CN from the week of December 1st onward, and we are in the process of securing meeting dates with CP Rail. 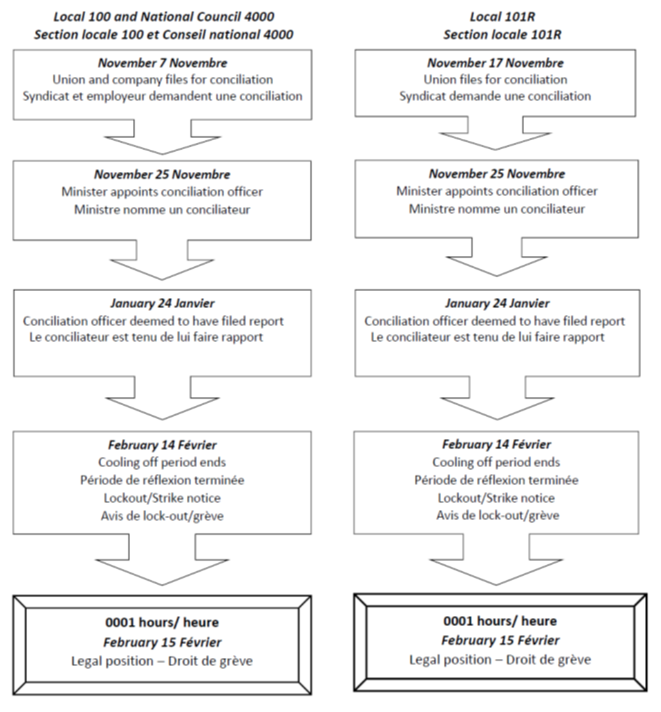 In order to have the membership understand more clearly the timing of the process, the chart below outlines the schedule that will be followed during these negotiations, up to and including the strike deadline. In closing, the Master Bargaining Committees for Council 4000, Local 100 and Local 101R want to express our appreciation to the leadership and membership for their ongoing support, as we attempt to renegotiate new agreements. The membership’s support during these negotiations will be critical to our success in these negotiations.